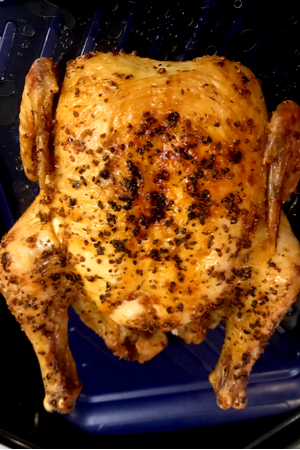 I can’t believe that I am saying this, but I have fallen in love with this air fryer whole chicken recipe. Almost every Sunday I cook a whole chicken. We will sometimes eat it for dinner that night. But most often we cook it as part of our meal prep for the week. 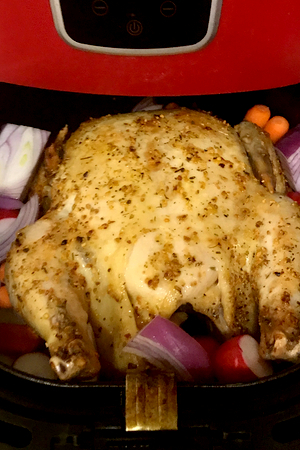 Air Fryer Whole Chicken – resting and ready to be carved. We use the meat for various recipes throughout the week. From our quick and easy Buffalo Chicken Wraps to our favorite comfort food – Chicken and Dumplings. And of course we will save the chicken carcass to make Chicken Bone Broth. I used to make the whole chicken in the oven. 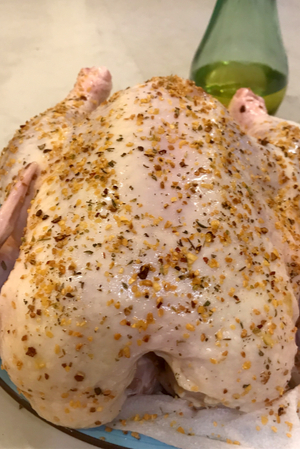 See: Oven Roasted Chicken Recipe. I love the smell of roasted chicken filling the house, especially on a cold winter day. However, in the middle of the summer, heating up the house was not an option. 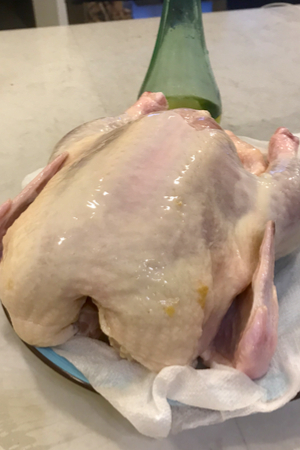 Be sure to rinse and dry your whole chicken before adding the olive oil. 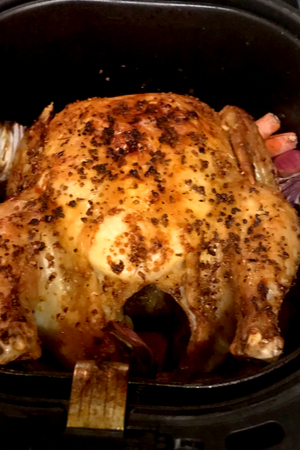 This is when I turned to making Rotisserie style chicken in my Instant Pot. Using the pressure cooker method, the chicken was done in a fraction of the time without steaming up the kitchen. The chicken turned out moist and delicious every time. But it was missing something. As hard as I tried, the skin would never crisp up like when it was baked in the oven. Even after browning the skin on the saute mode, it just wouldn’t remain super crispy after being pressure cooked. So I decided that I would give the air fryer whole chicken a try. I was hesitant at first. I expected the skin to get too brown and feared the center of the chicken would be underdone. Plus there was always the concern if a whole chicken would actually fit in the basket of the air fryer. Before I purchased my BCP 5.5 quart air fryer I did a lot of research. Almost every consumer review on air fryers that I read mentioned that they wished they had gotten a bigger one. Place the chicken, breast side down in the basket of the air fryer. At the time, most of the air fryers that were in the stores had about a 3 quart cooking capacity. That is okay if you are cooking for one or two people. However, if you are cooking for a family, you would have to do batch cooking. I don’t know about you, but there were two reasons that I wanted an air fryer. One, for cooking healthier with less oil and no deep frying. And two, to spend less time in the kitchen, not more. That is why I decided on the larger BCP 5.5 quart air fryer. Flip the chicken over and add the veggies. And I wasn’t disappointed when I tried to make my air fryer whole chicken. I purchased a 5.75 pound whole fryer chicken at the grocery store, just hoping that it would fit in the basket. Once I got home, I held my breath as I tried to lower into the air fryer. It fit perfect! The fear was gone and it was now time to prepare the chicken for air frying. On my first attempt I wanted to keep it simple. No fancy marinades, no brining, and no crazy dry rub ingredients. Air fryer chicken with cooked vegetables. Simply unwrap the chicken and discard the innards. Rinse the chicken under cold water until the cavity is cleaned out. 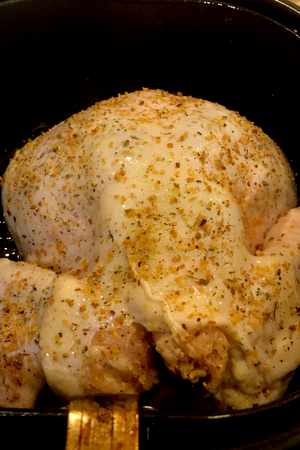 The most important step in making not only air fryer whole chicken, but any whole chicken is to allow it to come to room temperature before cooking. This will allow the chicken to continue to dry out and the meat to adjust to the temperature and retain it’s moisture. Once the chicken has been set out for at least 20 minutes, rub olive oil along the skin and inside the cavity. Sprinkle the seasonings both on the skin and inside the cavity. Then all that is left to do is place it in the basket of the air fryer. It is important to place the breast side down when you first cook your air fryer whole chicken. This allows for all of the juices of the chicken to be infused into the breast at the beginning of the cooking process, helping to keep the meat moist. 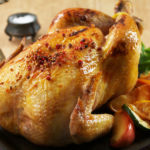 The results of air fryer whole chicken – moist, juicy and tender meat that is encased in a flavorful, crispy skin. As a bonus we layered vegetables around the chicken towards the end of the cooking process. The amount of cooking time will depend on what type of vegetables that you are using, their size, and how tender that you like them. We added chunks of red onion, baby carrots and whole radishes during the last 15 minutes of cook time. They were fork tender but not mushy at all. Vegetables are totally optional. Most of the time we cook only the air fryer whole chicken by itself. A quick, easy and healthy way to cook moist chicken with crispy skin without heating up your oven. Remove the innards from the chicken and discard. Rinse chicken and pat the inside and the skin dry. Let sit at room temperature for 20 minutes. In a small bowl, mix together the garlic and herb seasoning and ground pepper. 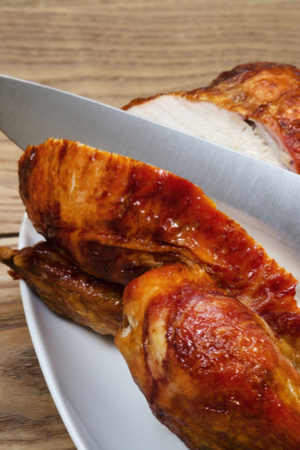 Rub the olive oil all over chicken – including inside the cavity. Sprinkle the seasoning all over the chicken – including inside the cavity. Preheat air fryer per your manufacture’s instructions. Place chicken, breast side down, in the basket of the air fryer. Cook at 350 degrees F for 30 minutes. Turn chicken over and cook at 350 degrees for an additional 30 minutes. Check the internal temperature to make sure that the center is cooked to at least 160 degrees F. Cook in additional 5 minute increments as needed. Remove chicken from the basket and cover for at least 10 minutes before serving. If you would like to add vegetables you can do so the last 15-20 minutes of the cooking process.